I didn't get to sew today because I had a dentist appointment for a filling and then a doctor's appointment. 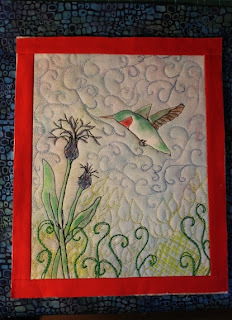 Yesterday, I did add a narrow red border in the quilt as you go method, and today I did sit down and add some color to the bird and flowers with Shiva Paintsticks. 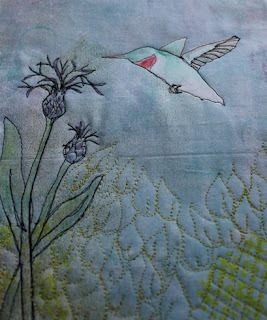 It is a little more fiddly to do a small piece with the quilt as you go method but I'm glad I did because I dd change my mind about the final border once I added the inner border and some paint. 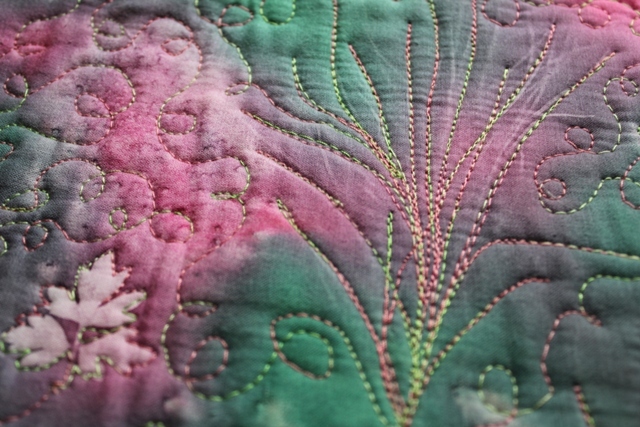 You can see a bit of the fabric I will use for the final border in the background. I do still have to add black stitching for the eye and hopefully I'll have time for some sewing tomorrow. This morning I went shopping for hoping to find a bathing suit and some blouses. I didn't find any of that but I got a bra, half price and and a zip up sweater for golfing. 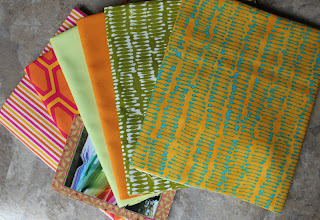 Oh how I loathe shopping, unless it's fabric, yarn, or art supplies! 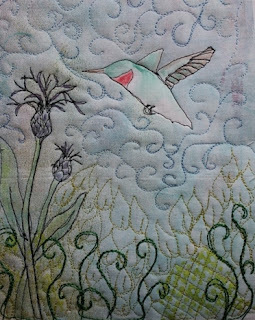 After lunch I added some pale color to the bird and the flower with my Neocolor II crayons and picked out some borders which I will add using the quilt as you go method. I've recently started doing this because sometimes after all the FMQ work is done I can change my mind about the border. I will be using Shiva Piantsticks for the addition of some richer color and I need to outline the eye as well. 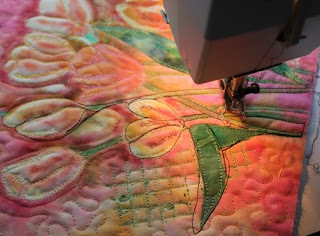 Next, I had so much fun free motion quilting on the hummingbird, that I could barely stop to make supper. 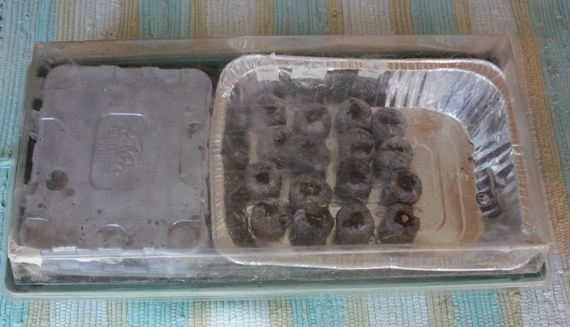 It is in the oven as I write this. I added some dense foliage on the bottom with a variegated green. The background color seems to have come out the best in this next picture. 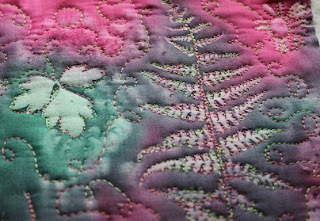 I felt the piece called for exuberant quilting, and so I continued with variegated light blue scrolls on the top. I've been following Leslie's blog and inspired by her lushness, I kept going layering on some bobbin work scrolls using a heavier thread called YLR worked form the backside of the piece. I can't wait to finish this piece! I'm testing an app that allows you to write a blog post and add a picture from the I Pad. I've taken the picture with the iPad and it's not the best. I promised yesterday that I would show some more of my printing results, so here are some with a seashore theme for which I made my own gelatin mold. I whipped the gelatin with a wire whisk for lots of bubbles in the gelatin. This shows up in the print. 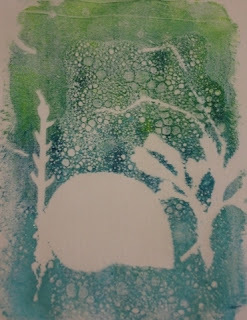 I used dried, pressed seaweed and a paper masque for the shell. 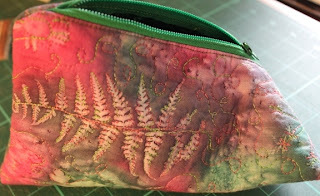 They will be developed further with stitch and paint. 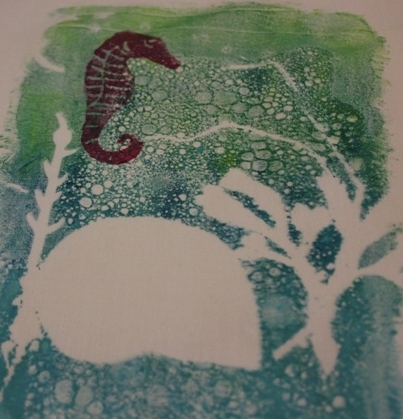 Here I stamped on my mono printed cotton with a homemade seahorse stamp. The seashell will be lightly painted in and defined with stitching. Don't you love the bubbles? 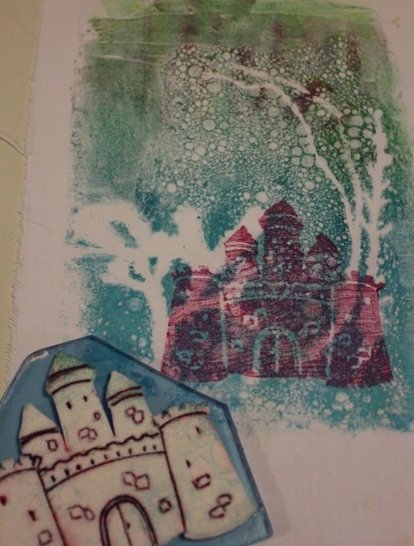 I'm aiming for the look of a fairy tale castle in the sea. made teh stamp with craft foam and mounted it on Plexiglas which my husband cuts and sands for me. 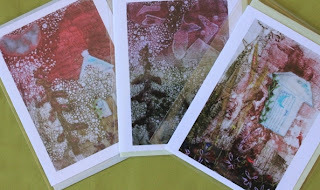 I did several more which you'll see off and on as I decide to work on them. I was out for lunch, errands and groceries today and when I got home I added a little more texture to my hummingbird pieces with screens, and odd bits of things I've collected with interesting textures. I was dying to get started on doing some black thread sketching. The last time I tried this, I used a tissue paper overlay which I did not enjoy picking off. I realized it should have been reversed and done from the back side but sometimes the bobbin stitching doesn't look as good as the top thread. This time, I lightly outlined with a pencil on the right side and then went ahead and stitched referring back to my sketches when needed. Something is missing in the bottom center. I will be adding something there. 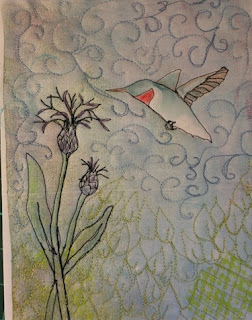 I've done the corn flowers before as some of you may remember. I love their colors and their wispy petals. 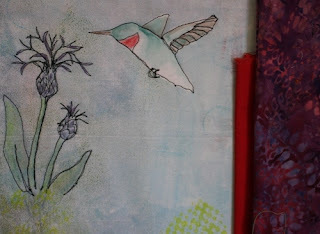 I will be adding color to the hummingbird and the flowers. 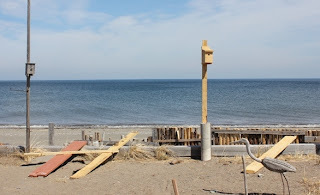 As i write this, I'm listening to the music on this blog. It is so beautiful! I was looking for a recipe for the sugar water to fill my hummingbird feeder when I decided to try some mono printing using the hummingbird as a motif. 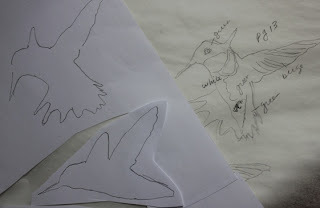 The first thing I do is to look for some pictures and trace some simple designs on tracing paper with notes on colors although that's not really necessary because once I decide to paint them on my fabric I'll look them up again. 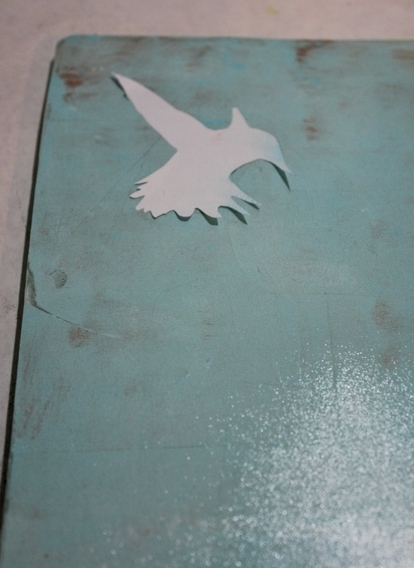 By holding the papers up to a a window, I trace just the outlines onto white typewriter paper and then cut them out. 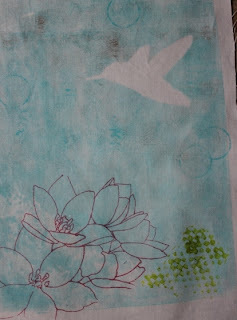 Once I iron some white cotton fabric to fit the Gelli printing plate, I'm ready to go. Using a brayer and a Styrofoam meat tray, I squeeze out a couple of colors of fabric paint, mix it some and then roll it onto the Gelli plate. 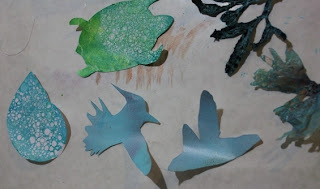 I then use the paper shapes that I have cut out as a masque for the paint. Here is where I have to remember to lay it in the right direction as the print will be reversed. 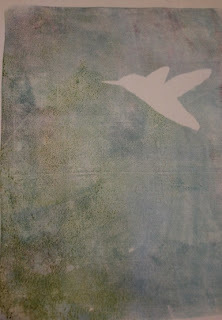 The picture below shows the paint on the Gelli plate and the paper hummingbird. It is ready for me to lay the fabric on and gently rub to get my print. 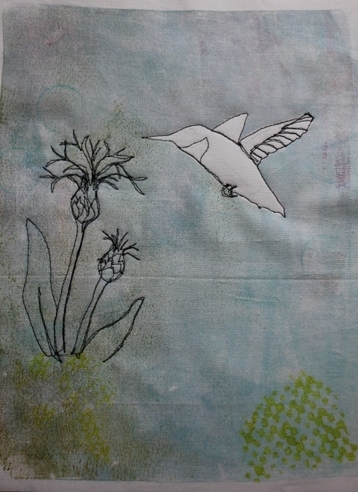 I did several prints reusing the hummingbird paper pattern each time. 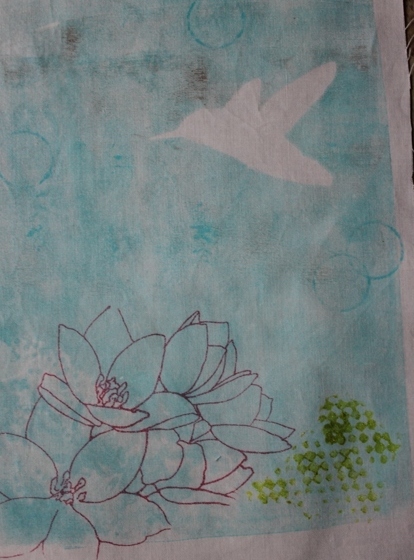 After letting it dry a bit, I used a Thermofax screen with flowers that my friend Margaret Applin sent me. Even the paint covered papers can be saved and reused. They would also be great for collage. You may notice some other designs in the papers above. 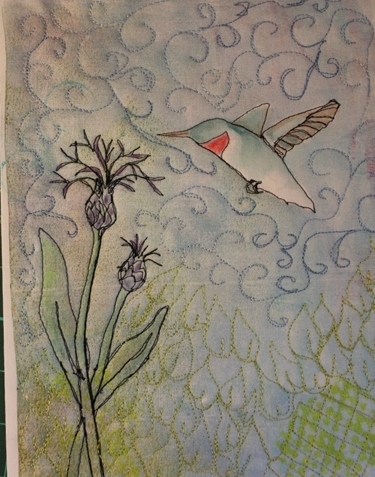 I also did some ocean themed prints which I'll show tomorrow. I just put my poor arthritic fingers through a torture test that I'm paying for now.. I made two of the pyramid bags that I gave the link for yesterday. Of the several that I looked at on the net, this one was the only one that I could understand. It seemed faster and easier than the other methods, but there was lots of maneuvering with the bag under the presser foot. 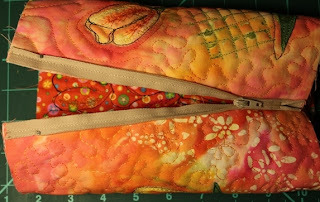 By stitching the zipper on as shown, I found it didn't lay back inside nicely, so I managed to sew a row of top stitching on the outside. That was tricky. The other drawback is that the front and lining are quilted and there is no other lining added as I noticed on some of the other methods. Then you're left with some raw edges that may produce a few threads (on the inside). 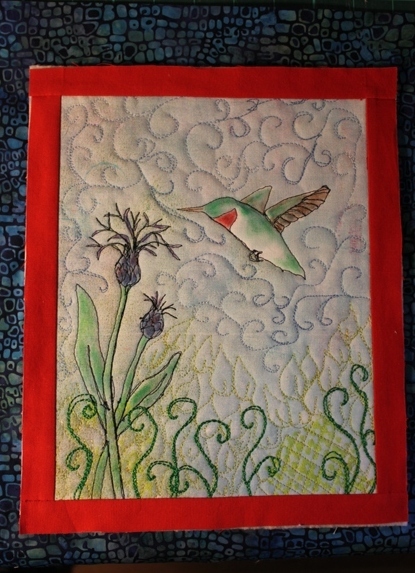 After i finished the first one, I pulled out my bin of printed and painted fabrics and decided to free motion quilt this one. 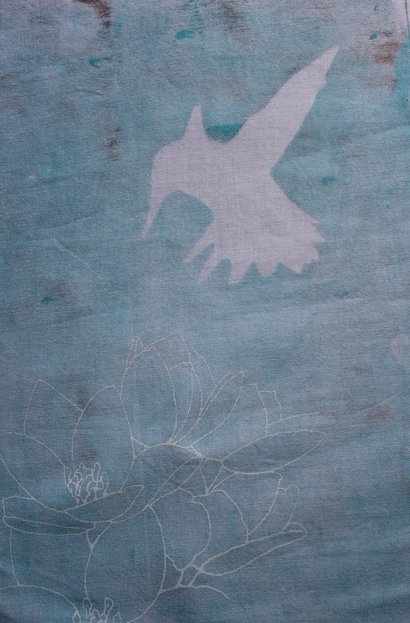 It is a sun print done with Setacolor transparent fabric paints. It was, I thought, a fairly blah piece until I added the stitching. Here is the back view. I apologize fir the lighting in this one. And the side view. It's a little more elongated because I followed my pre-cut sizes rather than cut off the patterns. If anyone finds a tutorial with an added lining that seems easy, do let me know. I left for my stress test this morning at 7:30 and got home at 1:00pm. This was a fasting test where I had 2 nuclear scans done as well as the treadmill part. I was given some orange juice a couple of times which helped. I was told that the treadmill part was good, so I shall just have to wait for the results of the scans. I'm fairly confident that all will be fine. Once I ate something I started making a new recipe for celery soup that I found in a free sample issue of the May 2012 Cook Vegetarian. My husband is coming down with a cold and I thought it would be just the thing. I also put a quick oatmeal cheese bread in the oven. My only problem is that I need a more powerful blender. 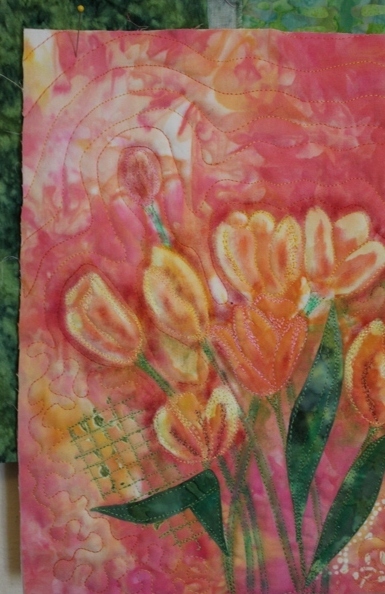 While waiting for it to cook, I decided to sit down with my tulips again. My friend Charlotte suggested they needed more definition. I think she had something like a dark orange in mind, but since I. was already out of love with the piece, I figured why not go for it and I used black. I'm still not sure I love it but I definitely like it better. 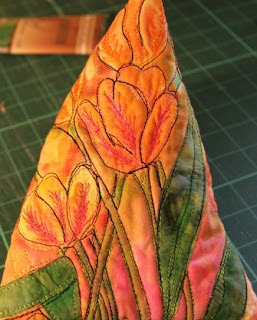 Then I decided to add a bit more stitching on the petals-- a little more needed to tomorrow. Now, I can't decide if I'll bind it or make it into this pyramid bag that I saw here. It looks pretty easy. The weather here is damp and cold; we even had some snow this morning! 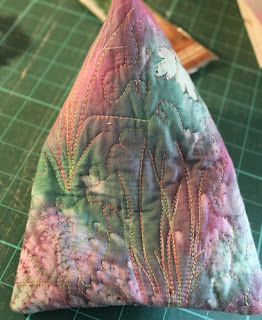 I've had a headache maybe due to the weather, so I didn't sew today. I do like to keep busy though and will often do clean up and ironing if I can't get to the machine. 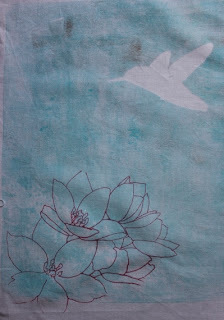 I did iron a few pieces of the new fabric which I got washed and I ironed the Saran with the bits of fabric leaves sandwiched in between newsprint and typewriter paper. I had finished meandering all over it last night. 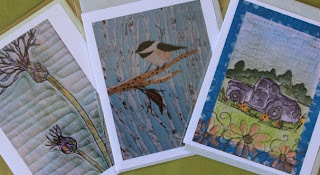 They are ready now to be cut apart and applied to the trees. Tomorrow morning, I have a stress test which is supposed to take a good part of the day. I'll be glad when it's over. I started out my day thinking that I might machine quilt my free form baby quilt. It was ironed, sandwiched, pinned and ready to go. Then I realized that because there were no borders, I had forgotten to make sure it was all squared up. 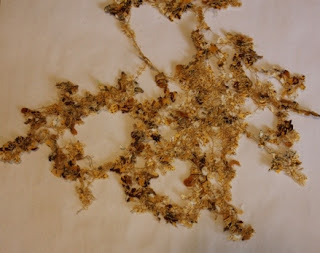 So I laid it again on the table and took all the pins out. Two steps forward, one step back. For anyone who may not have yet come across how to make sure that your quilt is a perfect (or nearly) rectangle, this is how I was taught by my friend Sue. Lay it out and fold the ends into the middle as seen here where I've folded one end over right sides facing. Check to make sure it is the same width across the middle as it is on the end. 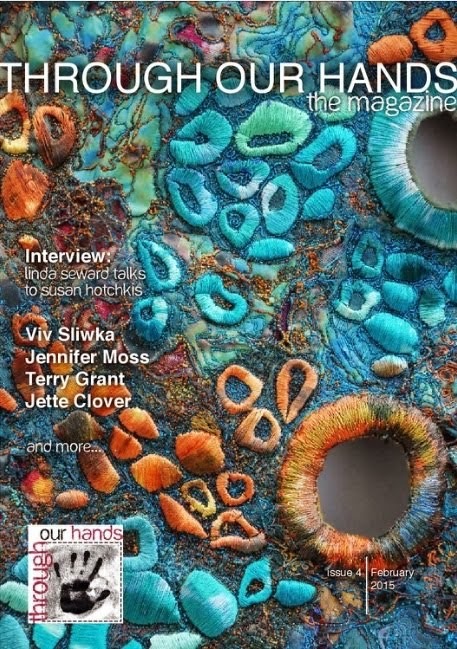 Sometimes as we sew out to the edges, it can grow. 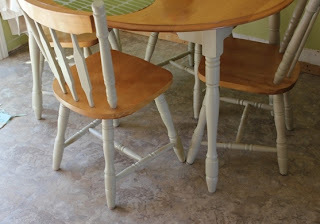 Do that on all four sides and make adjustments in the seams if needed. 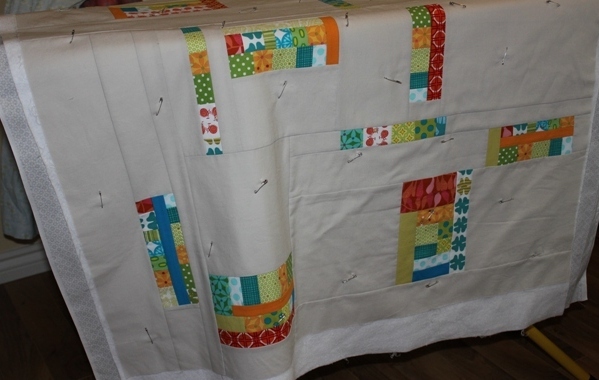 Now the quilt will be all squared up. Mine was OK; now I just have to re-pin it. Instead of quilting I began to free motion stitch my birches. 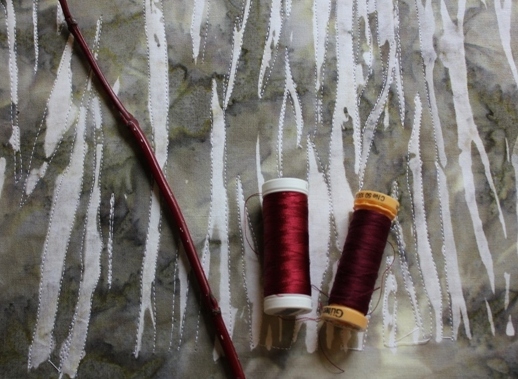 I am going to add some dark gray markings like birches have, but I don't want to lose the shibori affect, so I'll keep it minimal. When I was walking with my husband last night, I got him to cut me a small piece of a red shrub so I could match it to my thread. I want to make some small shrubs in the foreground and I think the red will stand out nicely. I also laid out my snippets of fabric (cut using a crisscross pattern with a wavy rotary cutter) onto a sheet of Saran Cling Plus. 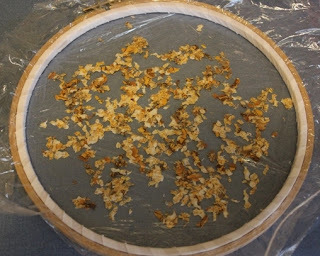 I was told in a workshop that it is the one with the least harmful fumes when it is ironed to melt away the plastic. The bits are sandwiched between two layers, the air bubbles are wiped out and then it is hooped. 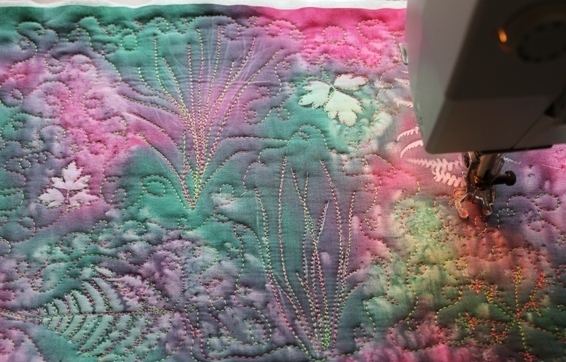 I took it to the machine and started meandering all over it to catch all the little bits. When that is done, it will be ironed between sheets of paper until all the plastic is all melted. Since I haven't finished all the stitching I will have to show that another day. I've been feeling in a bit of a creative funk since my last session at the sewing machine with the tulips. 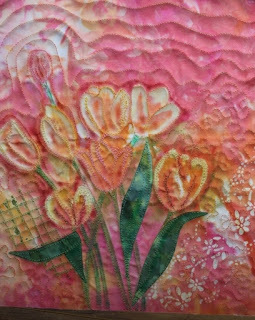 Sometimes too, when I have some administrative things to get done they stress me, so I decided this week to let the tulips go for a while and to get some things done off my to do list. 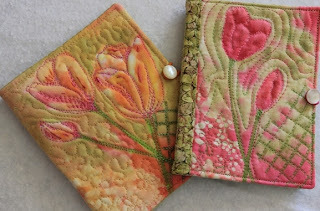 This morning I took pictures of my 2 sewing kits to get them listed in my Etsy shop. I've gotten one listed and hope to get the other one done later. I also took pictures of some of my cards to list including some taken from the wall hanging that was published in the Feb/March Quilting Arts. And last week, I forgot to mention that I sold my chickadee hanging to a fellow guild member. 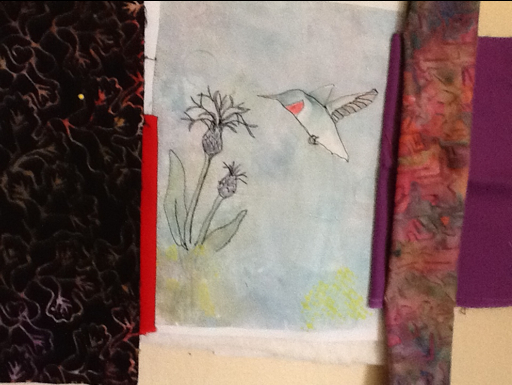 It pleased me to know that she wanted a piece of my art for her sewing room. You can see a detail of it on the card above. Although we are back to our seasonably cool weather out it was sunny and comfortable to walk after lunch. I am on a mission to lose some weight and perhaps cut some of my medications. I must walk at least 4 to 5 times a week. Soon it will be warm enough to bike. I found a parcel waiting for me today with these cheery fabrics. They could not help but raise my spirits! Then I took my camera down to Tetagouche River about a mile from my house. I had noticed some red bushes in passing and wanted them for reference for another piece I'm doing. I thought they were alders from a distance, but up close I noticed they have thorns and dried berries--wild rose perhaps. As if all that wasn't enough to brighten my day, I walked down to the river just in time to notice a young man with this black salmon who agreed to pose for a picture. He said it measured 32 inches. It was a catch and release. 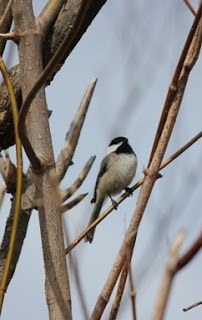 As I turned to head back to the car, I heard this chickadee singing in the bushes behind me. I've been reminded again how much joy there is in the little things. Just getting outside and discovering them has been fun today. 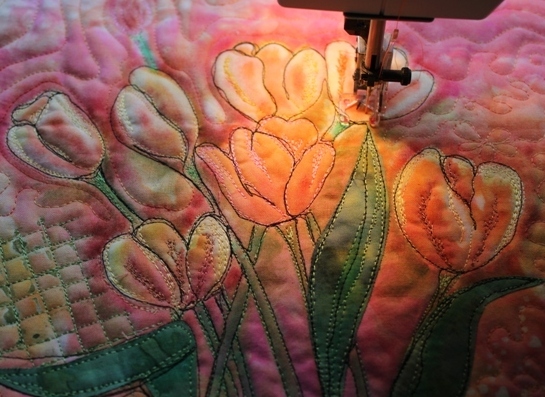 It's another week with little sewing. Our floor was finished up this morning. we liked it so much that we've decided to put it all the way down the stairs to the basement. I had to go pay the final bill and then pick up more supplies for the stairs. The windows are all open here and there's a lovely breeze blowing. It makes me think about the garden, so I started a tray of seeds first thing this morning. I'm pretty sure we've broken another temperature record for heat again today. My car thermometer said 28 Celsius or 82.4 F. We hardly get that kind of temperature in the summer let alone April! Oh, My husband just came in and said the radio is announcing that Bathurst is the warmest spot in Canada right now. wow. 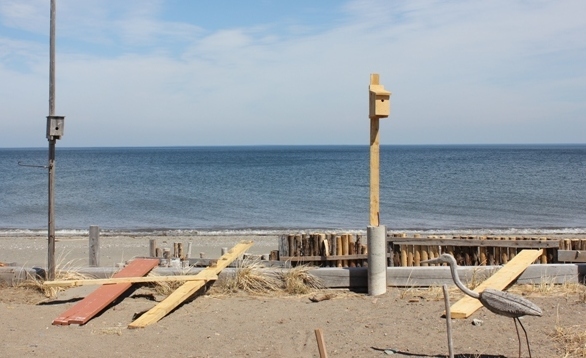 Since I was out for errands, I went to visit my mother-in-law for lunch and a walk on the beach. I just can't do it without filling my hands and pockets! We sat on the deck after lunch and the walk and I did some knitting. I had to rip out 3/4 of my afghan so I figured I might as well rip it all out. I was worried about running out of the yarn (from my stash) so I cast on less stitches. 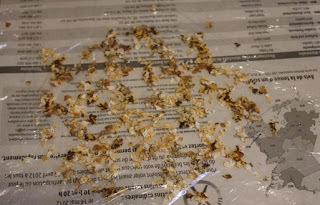 this is what it looked like before I ripped it out. So far, I've got a couple of inches redone--it goes fast though. There is a little fabric shop on my way where I planned to pick up a batting for my baby quilt but a note on the door said the owner was sick and it was closed. 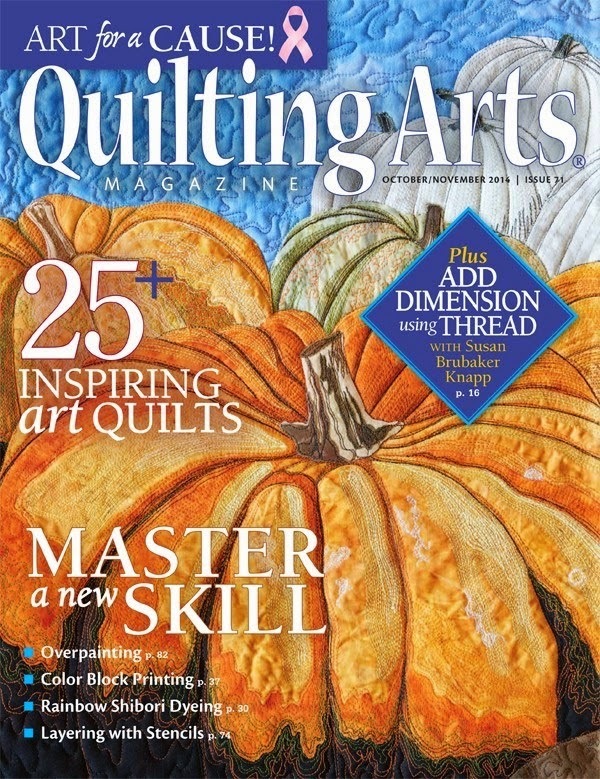 So, I've been busy, just not sitting inside at my machine. One really has to enjoy the weather as it comes. I think I'm going to head out now and do little raking. This week is starting out to be a little like last week. It's not that I'm going away, but I may not get too much sewing done earlier in the week. 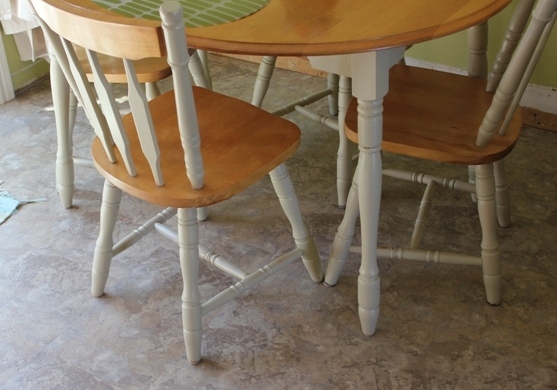 I'm having a new kitchen floor put in today, and I've discovered it's a little more work than having other floors done. Everything has to be moved including, appliances. I made us some wraps last night so I wouldn't have to get in the workers way. I'm heading out to get away from the noise shortly. Yesterday, I went out to my front yard and started some raking and clean up of my gardens. We have a small lot but with my fibromyalgia, I still have to divide it up into little sections. Usually, we're still under snow at this time; the backyard still has a bit of a snow bank. 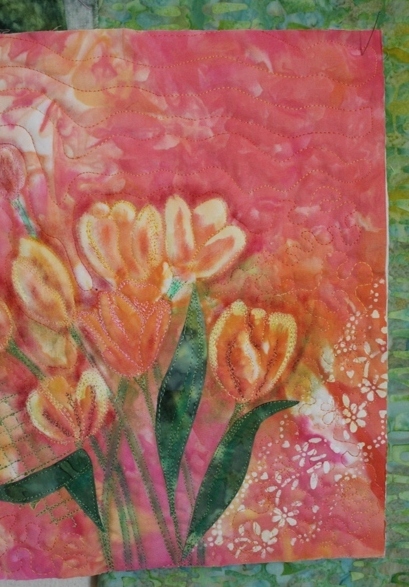 I finished quilting the tulips; I decided(I think) to do it as a wall hanging. I discovered when I hung my wash out that I had actually purchased a piece of batik that may do nicely as a binding. However, I'm disenchanted with it right now. I added some Paintstick as shading around the tulips to push them forward and I don't think I like it. 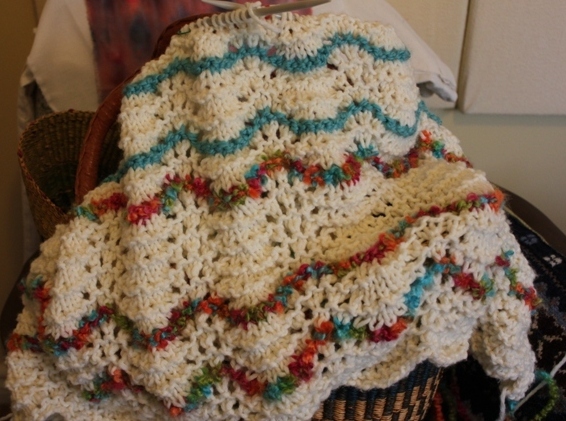 Also, last night while examining my baby afghan, I noticed that I had done the 2 stitches on the side borders a different way on each side. while I'm sure nobody would ever notice, these things bug me and I knew at bedtime that I would have to rip it out. Unfortunately, I must take out about 3/4 of it. My philosophy is that it is the process I enjoy, so it will give me a little more 'process'. At least I am very happy with the colors. This is a dinner I made on the weekend, veggie loaf, stir fried Chinese broccoli and sweet potato. 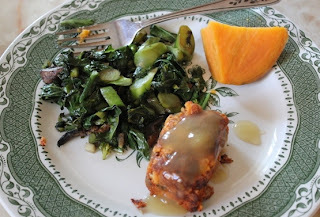 I've discovered this site which has lots of great vegetarian recipes. I'm back and ready to sew!